Last week, I published a blog about the MIDNIGHT’S EDGE tabloid-style reporting on Star Trek…and the controversy it often triggers among fans. I myself am more than somewhat conflicted when it comes to this video series and the content it presents online. I also reported last week that the Fan Film Forum Facebook group was being polled to see whether members wanted to ban all postings providing links to Midnight’s Edge videos because such postings tended to rile up many fans on both sides of the Discovery/CBS fence (supporters and detractors) and result in rancorous commentary. After a week of voting, the polls closed last night with a final tally of 21 votes to ban and 40 votes not to ban. So by a margin of 2-to-1, there will be NO censorship of Midnight’s Edge on Fan Film Forum. I have to say, I am very relieved. I’m not comfortable with censorship of anything that isn’t rude and crude, insulting, or patently false. And as I said, Midnight’s Edge isn’t patently false. But it is filled with rumor and innuendo that all too often turns out not to be true. Obviously, their “reporting” from last summer was completely wrong. Meyer has now said that his project was only ever commissioned as three-night event and not a new TV series…and certainly not as a replacement for Discovery. Granted, back in their 2017 podcast, Midnight’s Edge did say “word is…” and “rumor…”—so Midnight’s Edge isn’t committed to standing behind what they said last year. But let’s face it, when listening to that second video (from 2017), it’s hard NOT to assume that these rumors are true, right? The narrator’s voice just sounds so sure and confident. 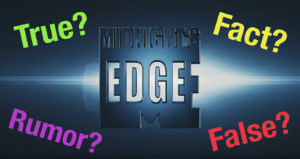 In a perfect world, Midnight’s Edge would report only verifiable facts and not rumors and speculation. But then the world wouldn’t be so perfect for Midnight’s Edge…which I’m certain would not have nearly as many views. So once again, I advise folks to take what Midnight’s Edge says with a healthy pile of salt and listen carefully and intelligently, not blindly accepting everything they tell you. It has been too easy in the last decade or so to become polarized over so many issues. 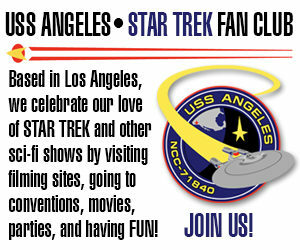 Umfortunately that includes many things Trek related as well. Lots of humans too eager to chum the water and lots of humans too eager to bite. I am guilty a.f. of the latter. Next Next post: VOYAGER CONTINUES: RAVEN is now STARSHIP PROMETHEUS…adds new CGI footage!